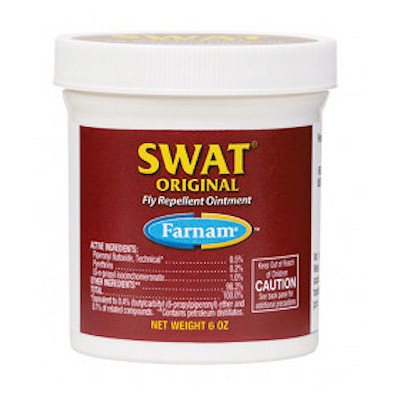 Swat Original Ointment-Pink (Farnam) repels house flies, stable flies, face flies and horn flies from wounds and open sores. Also kills them on contact and effective for hours. To treat superficial wound, abrasions, sores and scratches, apply enough ointment directly to the wound to cover the wound and use daily. Safe to use on dogs and horses over 12 weeks of age. Consult a veterinarian before using this product on debilitated, aged, pregnant, nursing or medicated animals. Do not use on horses intended for slaughter.